New drivers and electronics technology improve sound resolution making the 8030B ideal for music studios, mobile vans, digital workstations, radio and TV broadcasting. When your project requires a powerful performance with no sacrifice in quality, the Genelec 8030C active studio monitor is designed to exceed your expectations. The 8030C, introduced in 2017, even delivers 4 dB higher SPL and has a lower energy consumption than earlier models of 8030. As strikingly stylish as it is sonically impressive, the 8030C features the rounded edges and colour-free, accurate reproduction of the rigid all-aluminium Minimum Diffraction Enclosure (MDE). Every element of the design is crafted to perfect your listening experience. Precise on- and off-axis frequency reproduction is courtesy of the Directivity Control Waveguide (DCW). Broad low-frequencies and high SPLs are delivered with a flow-optimised internal curved reflex tube and a maximised internal volume. 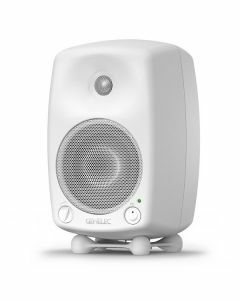 And when you’re finished, Genelec Intelligent Signal Sensing (ISS) circuitry detects when your system is no longer in use, placing it into an environmentally friendly, power-saving standby mode. From professional studios to outside broadcast vehicles, the 8030C has been crafted to combine extraordinary power with absolute precision.